I know no one is going to believe me, but about 3 years ago, i worked and lived in a pub, bare in mind i do not drink, or do drugs, i was on the roof having a cig,(i guess nicotine is a drug but yeah..) i saw a little green glowing thing, that if i ever talk about it, i call it a big moth, because i dont want people to think im insane, lol. it was about the size of my palm. i saw it half peeked out from behind the chimney, and then stopped and looked at it whilst the blood drain from my face in shock. it went back behind the chimney, and then whilst im thinking...did that just happen, it peeked out again, and then flew away in diagonal up to the sky. i have never seen a moth or a bird fly this fast, there was no apparent wings, and it flew in a straight line to were ever it was going. i waited for a while to see if it maybe would come back. but it didnt. i know your thinking....green and glowing.....nahhhhh, but seriously, it had its on light source. was a really vivid green, and i have never forgotten any detail from this. it was actully like it was looking at me, and like it was scared i had seen it, the way it peeped out from behind the chimney, before flying off at high speed. i have always tried to convince myself it was some kind of moth, that i have never heard of. or the biggest firefly ever. the town is quite light at night, so moth would fit, but why would a moth with its own light chill out on a chimney?? i just want to know if anyone has ever heard anything like this. its weird i look up stuff all the time since that, ufos, cow mutilations, myths, legends, weird animals, and unknown creatures, but have never come across anything like that. any ideas would be helpful, unless all you have to say is little green men. cus it waws not a man, men cant fly. cheers for reading! Hi everyone I am new to this forum and would like to ask some advice if I may. I own an old two story railway station and for the past 6 months or so, my 16 year old son has been sleeping in the old bar/refreshments room while we have been renovating the rooms upstairs. it was probably from that and closed it to see if it went away. But it didn't. I sat there for a good 10 minutes watching this light turn from orange to green to white and a couple of times it shimmered like glitter. this have been and is it anything to worry about? Also, check out the Hessdalen lights thread. In short, it's just as you describe. A small glowing bird which can fly using a pulsing technique with it's wings closed in a bullet shape. Great account and thanks for sharing! Now, I've just seen this which I didn't know about before. Maybe the quietness of the nuclear plant was a haven for these green glowing birds before the big blow-out? .....YAY. thankyou so much. the last video you posted is the exact same colour. i did think anyone was going to reply. but there it is. in full technicolour. not sure of the size of that one tho, as there is nothing to compare it to in video. im just glad it wasnt a one off, because now although its not my video, i have something to almost prove it! and then the bat somehow glowed, but only the torso, hence why i didnt see any wings. also glow worms are toxic. although i know there are birds that eat bees, but they remove the sting. 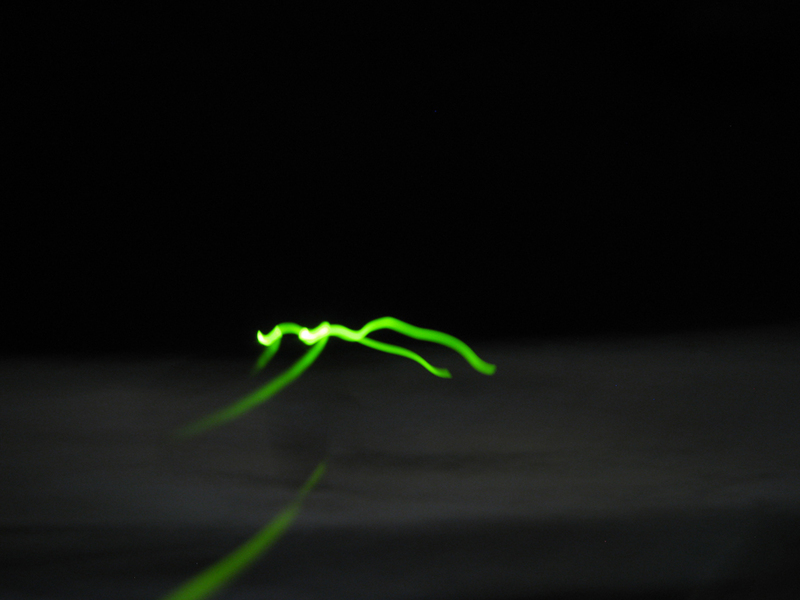 infact glow worms are the only insect or animal i can find that glows this green light. im aware they have made loads in labs, but these need a black light or blue light on them to glow, and also coral glows uder same lights. Hi I was surfing the internet trying to find people who've had the same experience as me. Your experience is the closest could find to mine its not exactly the same but hell ill just write it up since i never have & in retrospect i have been thinking how odd my experience was. So let me just share this with you. It was in 1997 I was hanging laundry on the balcony it was twilight & the sky was an orange color. I saw a flock of birds around 4 or 5 flying in a migration formation. The only weird thing was that they were glowing a whitish green color. Usually when i see odd things like this I will call out for others around me to come & see (like i have done in the past a few times) but this time I had this impression that this moment was only meant for my eyes & if i did anything it would disappear so i decided to just enjoy the ''show''. So as the birds flew they starting merging together into a ball of the same green glow but in a ball shape then it disappeared. I wondered where it went so i looked at a different area in the sky and saw this ball of light bouncing in the sky then disappear again only to see it somewhere else (all the while i was just thinking this was odd & amazing). Then from behind some trees that were over to my right they were back to glowing birds again flying in formation & few out of sight. I went back in the house and told everyone what I had seen & they were not convinced & said it was probably the glow of the sky on the birds (though the sky was orange not a green color) so they went to the balcony and as we waited we saw a single bird fly by the difference was the bird was black like a silhouette. There was not comment. I think they were just baffled & they went back inside the house. Well if this story makes you feel any better about your strange experience hurray! That'll be all. yup! totally makes me feel better. i get what you mean by not calling anyone. when i saw mine i was scared to breathe in case it scared it off, or changed what was happening. I believe you saw it! you mention you have seen a few weird things, which most people probably think then you have over active imagination...(people do to me) but in all honesty, i think most people are oblivious, and never see past there own nose.lol. We obviously look into the distance alot, and our minds are open. What other things have you seen? ( i hope for aliens greatly so maybe a bit biased) but if aliens did exist, and have a way of observing us, what better way than to take the shape of a bird!! If not aliens... consumed radioactive material, (as birds eat ANYTHING) or maybe even perception of colour which 'apparently' humans cant see, although there have been cases of people seeing colours that dont exist, or there was a man who had his eye lens replaced, and then could see ultra violet light, for the rest of his life. if i knew you, and was there, i would of been really upset you didnt call me. lol. Fantastic account! Thanks for posting! As you said, theres nothing in the video to gauge its size. The same lack of anything to reference it to makes it hard or impossible to determine movement also. Any apparent movment can be attributted to the unsteady handheld camera. So apart from the color, what has this video really given you in corroboration to your experience? Skeptics say orbs do not exist,and if caught on camera,its dust. That can be true,but some orbs are real. Stuff caught on camera,is just the energy being caught. I think in some cases,if the energy is strong enough,and someone is sensitive enough,it can be seen with the naked eye. I experienced this once in Tokyo,in 2004. It was shaped like an upside-down tear. There's a lot to this story ,as we went on a ghost hunting expedition so to speak,because friends of mine had found this house in Ebisu,and a few weird things happened to them there,and I said GHOSTS ! I WANT TO SEE ! So we went in the dead of night just as a lark,and some bizarre stuff happened,with all three of us seeing and hearing different things,and its the one and only time I've seen a corporealized orb. They couldn't see it though.We ran out of there crapping bats and bunnies. The whole incident is in my old journal. Im cannot be sure,but I wonder if you saw orbs,which are spirits ,more or less. What objective method do you use to determine which orbs are dust and which are actual spirits? Or is it just whichever you decide them to be in your own opinion? What proof do you have that any orbs are spirits or thaat spirits even exist? You are using nothing but your own unfounded beliefs as a starting point. I live in Arizona and about a year ago now I saw something that exact same green color shooting across the sky. I think I even posted about it here somewhere. It was an extremely creepy experience. My 2 friends,had walked by this old house. It was set back from the little street.Apartment buildings were next to the street on either side,and you had to walk a good 20 feet,and then you came to steps . So it was _| |_ like that .the house was in that little indent.as you came to the back of the apt buildings,there was a small sluice way.like a small drainage pit,that ran parallel to the street. At that point,you had to step over a little concrete bridge,and go up steps,just to get to the house property,which was quite big for Japan.you had to go up steps to get up to the front of the lawn,that led to the house . What my friends told me was,they walked by one night.One lived in ebisu,so as they walked by,they look into this little break in the line of apt buildings,and way up this hill and steps,is a huge house. One girl was dating this guy,that was one of those people they actually test for psychic abilities. The cards and all of that.I think it's common in Japan.Hes a twin,and both he and his brother tested high or something. So they walk up the steps,and the mail box was filled to the brim,like the place hadn't been lived in in a long time. So theyre just starring ,and every light in the home was on,both floors,and its midnight.very odd . So as they stand there at the top step,a tiny Japanese woman,dressed in what looked like ww2 era clothing,with the scarf pouch on her back and everything,silently walks by going uo the steps. That alone was odd,but they said she didn't say a word. I mean you think she would say,what are you doing here ? It made me think of that creepy white haired lady in house on haunted hill,that seemed to float,not walk. Totally silent.She made not a sound.No steps,rustling clothes,like nothing. They both jumped, holy crap ! And she answered the phone.Her bf was like ,WHAT ARE YOU DOING !? Like he just knew something was up. So she's answering him,and they look back at the house,and this lady had vanished. The next set of steps up to the home were considerable,and they didn't think she could have gotten in so fast. They just got creeped out ,and left. They told me this story,and I had to see it. It was winter and freezing,and I had walking pneumonia ,but I had to go. We went 3 days later . Its obvious which is which. This doesn't answer the question at all. How do you determine what is obvious? 20 years of empirical investigation and research confirm to me that all photographic orbs are particulates illuminated by the camera. You dont see how that is a completely subjective decision on your part do you? Quite possibly ,as I do not *care* about all the alleged scientific semantics ,and gosh its not proven ,blah dee blah dee blah skeptic theories. As I said,I saw one with the naked eye once .One of my cats had them all around him in photos when I first adopted him,no matter where the photo was taken,time of day.No other cats had the orbs around them,same photos,just one ,and they had tails,as if moving. Ones that look like water on a window pane,yah,dust,moving tails and seen with the naked eye,real. That cat had lived in a witchcraft Shoppe prior to my taking him,where numerous rituals took place.Who knows what attached itself to him . I cleansed my cat with a small ritual,and all the orbs were gone in any photos there after. My beliefs on it .No interest in proving any of it scientifically . seriously......are you a troll or something. I am so glad I found this! Original poster...re: green light. I thought I was going crazy! About 5 years ago, I was at my parent's house, outside their basement door smoking a cig and to my right a green glowing light came quickly around the corner of their house. It stopped fast, hovered over near the h/ac unit went down and up and took off back in the same direction it came from. It was like I scared it. Or it was surprised I was there? There was definite intent with its actions...not like an orb. I thought to myself, " What did I just see?!" I started Googling: drones, green lights, green orbs, green glowing bugs, radioactive hummingbirds. I knew it wasn't a bird or luna moth...those create shadows. It had it's own light source. It was the size of my hand with the glow but the brightest part was the size of my palm. It was only appx 12 feet away. It was on the opposite end of their deck but lower. About head height when it stopped, maybe a little higher, their ground is uneven by about 2 feet from erosion. I have taken everything I can into consideration. It was late at night, I was visiting and sleeping in the apartment downstairs. I Googled for hours...nothing...well mostly UFO green light reports. This was not on that scale. I thought...FAIRY? It sounds like something paranormal.You are crazy for smoking ciggies though. Look like a click beetle.. they are impressive, big and fast and are glowing green like crazy. Seen them a lot in the central america in forested area, incredible insect. When it's not flying, wings are folded up and look invisible below the first two who acts like shields (elytron)..
That's a picture of one flying passing by in the jungle in Belize. Hard to track but you can found them in Florida too.